Does snake venom hold the key to curing cancer? 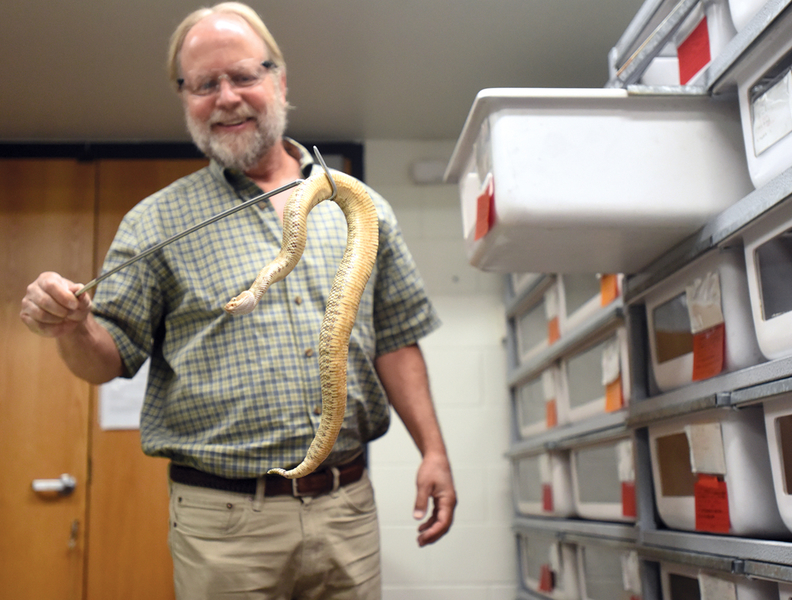 Steve Mackessy retrieves a snake used in his venom research at the University of Northern Colorado campus in Greeley. When Steve Mackessy opened the door to one of his favorite rooms on the University of Northern Colorado campus, it erupted with a noise like a mix of cicadas buzzing, rain hitting a metal roof and raucous applause. “They're just saying hi,” he told the Associated Press, grinning widely and gesturing to a room lined with bins containing venomous snakes. Yes, their venom can kill, but Mackessy believes the same venom that can destroy human tissue in less than a day could one day cure cancer. Mackessy could talk for hours about the toxins in snake venom and how he and his students study it, but the process basically boils down to three steps: extract snake venom, study the toxins inside it and how the snakes use the venom, and study those toxins' possible effects on humans and cancer cells. Almost as sinister as the snakes in that rattling room is the large, liquid-nitrogen container upstairs filled with cancer cells. In a refrigerator near the container are vials of snake venom. The venom doesn't change much, Mackessy said, especially once it's freeze-dried and put in a fridge. That sturdiness is one reason the toxins in snake venom could be useful in medicine. “A lot of other protein drugs are inherently unstable, but venoms in particular are designed to be stable under bad conditions,” he said. What excites him the most, however, is the way snake venom has evolved to attack the specific prey in the snakes' diet, as well as the predators that threaten them. “These toxins bind very specifically to these particular creatures' receptors,” he said. Therefore, the toxins have the potential to be used in a drug that would affect the cancer alone.